John checked in on April 10, 2009. 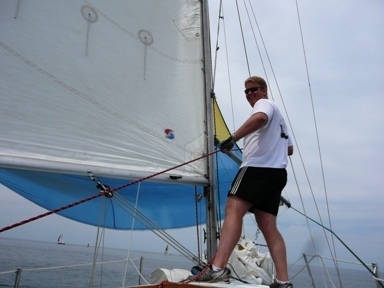 He is the current Fleet Captain of Wilmette Harbor's fleet of 15!!! Dolphins. 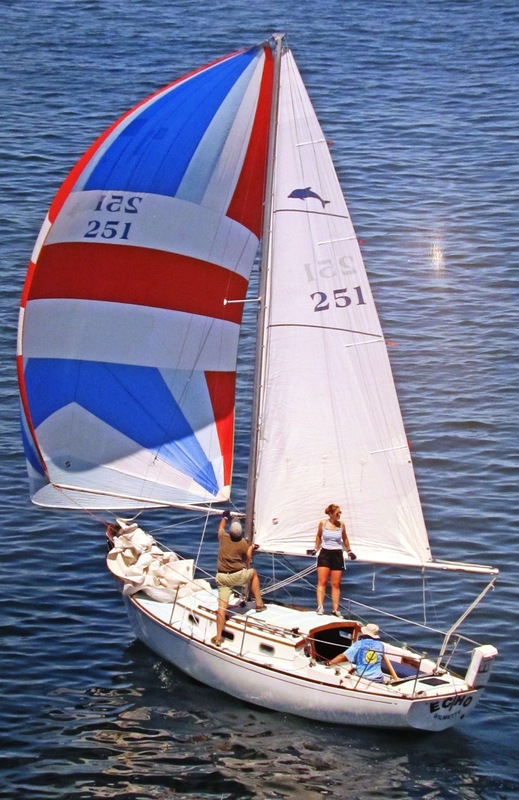 Echo has had 5 owners and has spent all her life here at Wilmette Harbor. John bought her in 2005. Here is a picture of Echo in one of those Lake Michigan breezes. 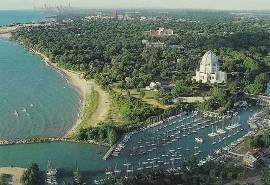 Wilmette Harbor is a tiny little harbor 16 miles north of downtown Chicago. 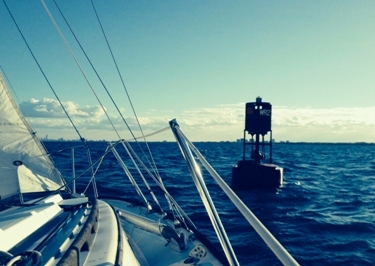 Here is a picture of the harbor looking south down toward Chicago on the horizon. This is a super photo, I think. 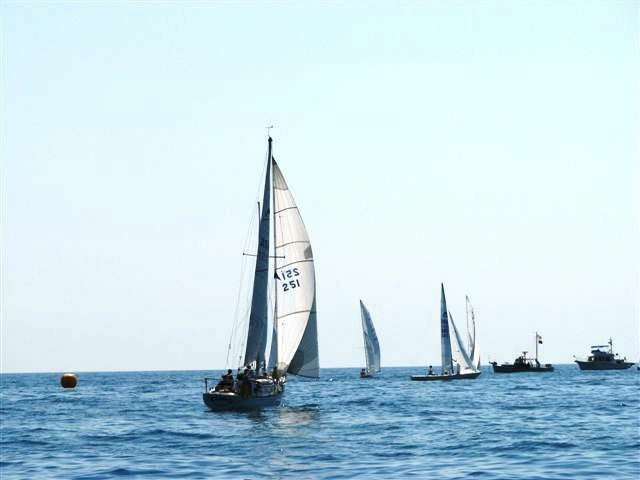 For a larger view and more about Wilmette Harbor and its fleet of Dolphins, click here. This is a small tighly packed harbor and the wise boat owner protects his boat. John sent in some other photos, a few of which have been digitally altered. I think this looks really cool. Here is one. 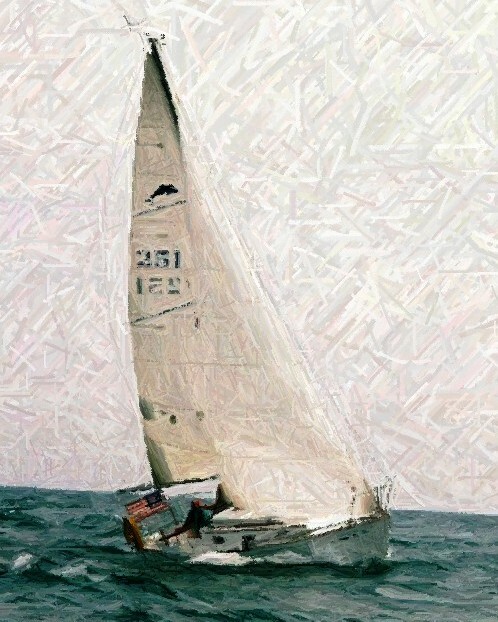 For more Echo and Wilmette fleet photos employing this technique, click here. End of season? or beginning? January 28, 2019. 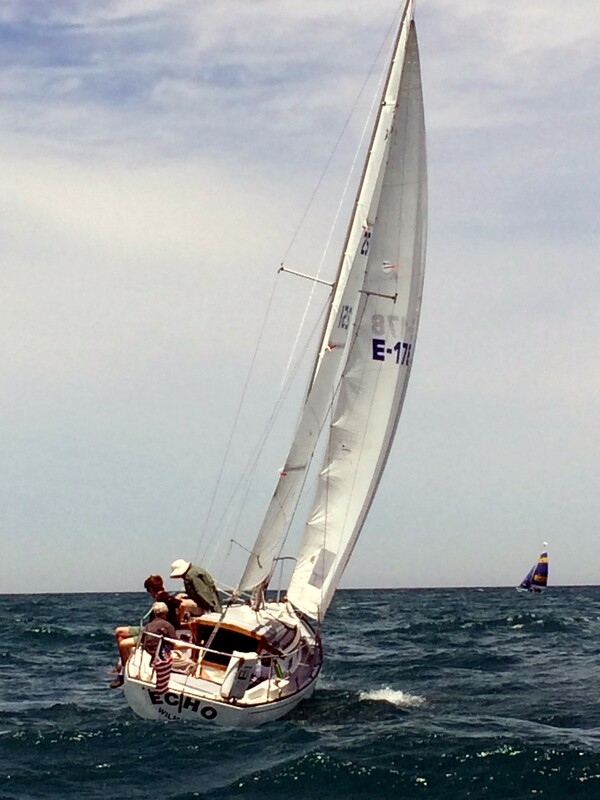 John is checking in again as Wilmette Fleet Co-Captain. A copy of his email is posted on the Wilmette Fleet page. Here is his email and some photos. 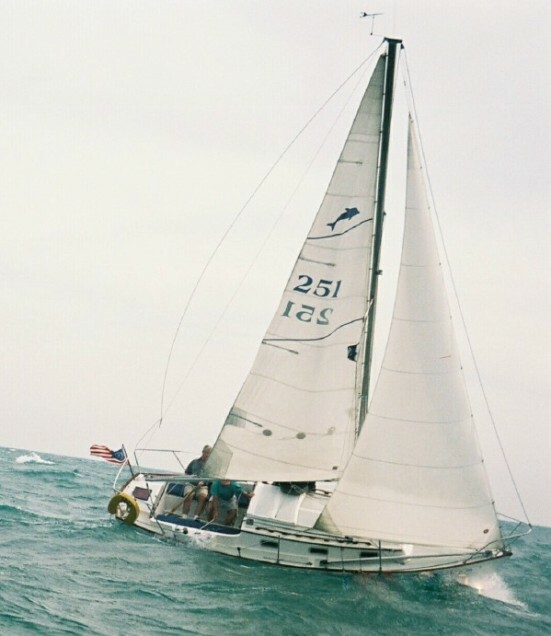 You may remember me (Echo-251), we wrote to each other a few times several years ago when I was captain of the Wilmette Dolphin Fleet. Well, things have circled back and I am co-captaining with my good friend Ted Prohov (WADA-190). It is exciting that you have been racing your Dolphin in Camden. My family has a cottage on Christmas Cove/Rutherford Is. (end of the Damariscotta River and across from E. Boothbay) not too far from Camden. We will be up the 2nd half of August this year. I often think I have spotted another Dolphin up there but it usually turns out to be a similar O’Day 25 or 26 design. Let me know if there will be Dolphins participating this summer. 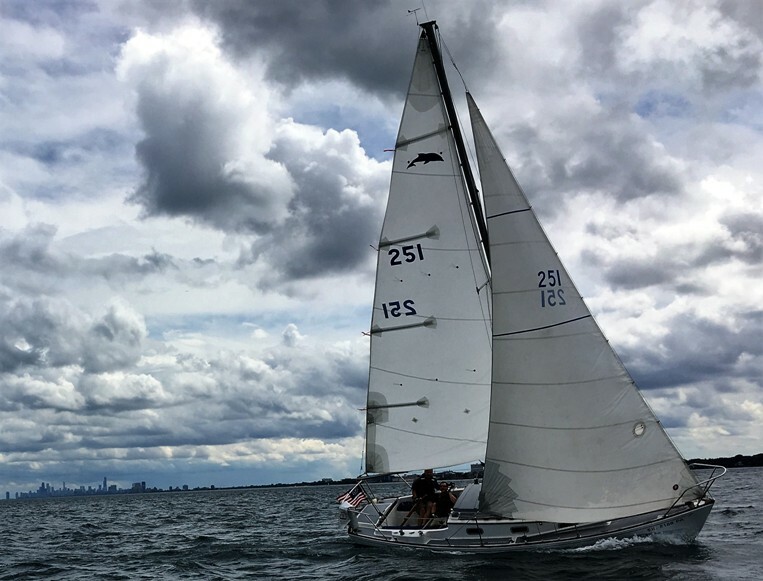 Who knows, I may be able to get a couple of us up there –Too far to tow our Dolphins from Chicago but could crew....Webmaster Note: Dolphins will be there, 2 already entered - check out our webpage for the 2019 regatta http://dolphin24.org/ccc2019.html. 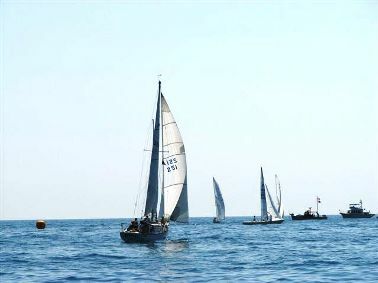 As far as news from the Wilmette fleet – we are 14 strong however the number of Dolphins on the race line has been lower than usual. Many races with just 3 on the line, but sometimes as many as 6. We hope to encourage more this year. Hope you are weathering the storms well. I attached a few pics.